Do you know why I know it is winter? Upon arriving at work this morning all our door locks were frozen! We eventually got in- but not before I was seriously regretting leaving my gloves at home. There's something about the first subzero temperatures that surprises me each winter, and this morning was no different. I thought I didn't need gloves- and I was wrong. Although my morning and evening commutes were draped with clouds, central Ohio was treated to a quite nice mid-day sunshine event. As winter drags on, sunny scenes like this one will decrease as we plunge into the gray abyss that is winter here in Ohio. 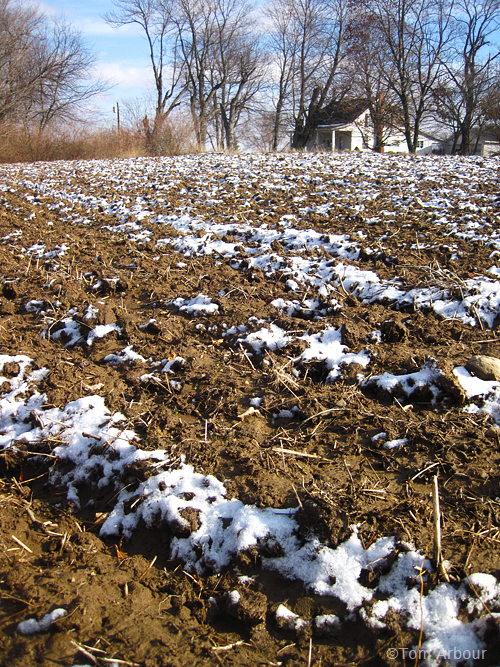 It's hard to believe that this field will be warm and full of soybeans in only six months or so. Hi Tom..It looks like it could be winter setting in, but you never know .... here in Maine today it was sunny and 50 degrees after a wild windy rainy night last night!! Thanks Grammie! I read today that it looks like Maine is in for more rain. Since weather moves across our great country from west to east, we're often calling Megan's parents to tell them what's headed their way. Get ready, it'll be cold before you know it.